Save Mission Trails is a 501(c)(3) tax exempt Non-Profit Mutual Benefit Corporation. Our mission is to inspire the preservation and conservation of Mission Trails Regional Park and adjoining East Elliott Community Open Space. We are campaigning to protect our park and communities and preserve our quality of life. September 15, 2014: The application for the Quail Brush Power Plant — discussed below — was withdrawn. June 11, 2016: SR52 between Tierrasanta and Santee received California Scenic Highway Designation. June 21, 2018: The proposed gas pipeline through MTRP was rejected and withdrawn. 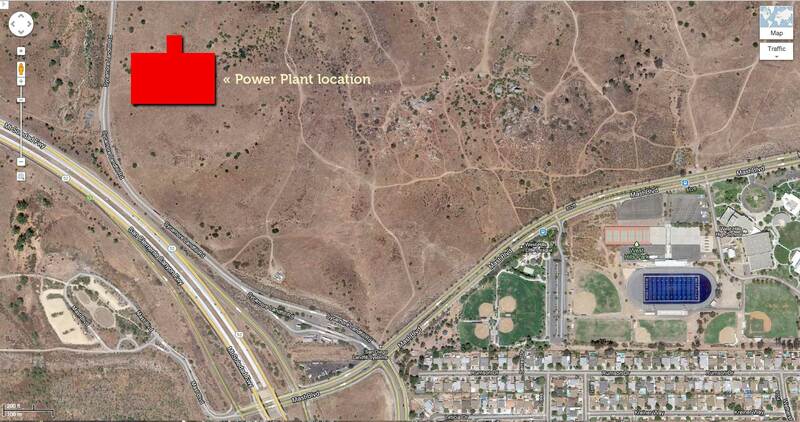 The Quail Brush Generation Project Power Plant is proposed to be built on the border of Mission Trails Regional Park (MTRP) and Santee. Its placement is within San Diego. The power plant’s nearest neighbors would be West Hills High School, Santee residents, and MTRP. The noise and pollution would be substantial. The area is not zoned as industrial, yet a state agency, the California Energy Commission (CEC), can override San Diego zoning rules to permit this fossil fuel plant. Mission Trails Park and all its history would be harmed by the noise, air pollution and visual blight. West Hills High School is 845 yards from the proposed plant (less than 1/2 a mile). Power Plant Map. Click on the photo to see it large. Here is a close up. It is to scale. Yes, the power plant is huge. Click on the photo to see it large. The Quail Brush Generation Project is proposed to be developed on a 21.6-acre parcel, located in the City of San Diego, California, on open space-zoned land called “East Elliott.” Click on the image to enlarge. 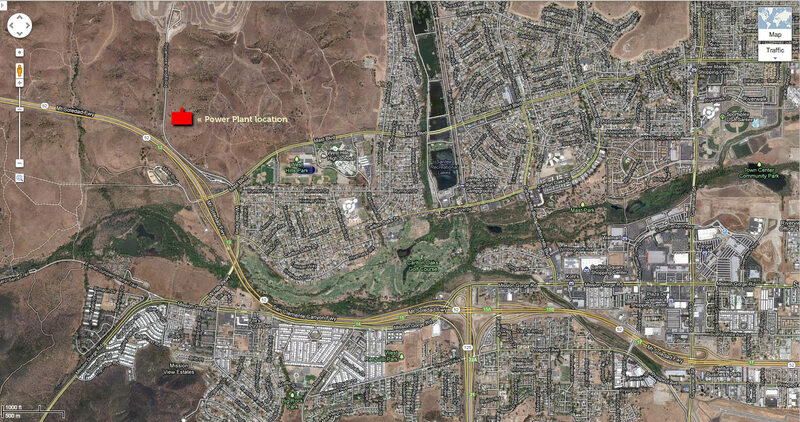 The proposed site is located west of the City of Santee, south of the Sycamore Landfill and north of State Route 52. The proposed project is a nominally rated 100-megawatt (MW) intermediate/peaking load, electrical generating facility that would employ a set of eleven (11) natural gas-fired, reciprocating, Wartsila engines. 2,200 feet of 8-inch diameter natural gas pipeline lateral between the project site and the existing SDG&E 20-inch diameter high pressure natural gas pipeline located across Mast Avenue from the landfill entrance and associated onsite metering station. If the proposed project is approved by the CEC, the applicant plans to construct the project in approximately 18 months. 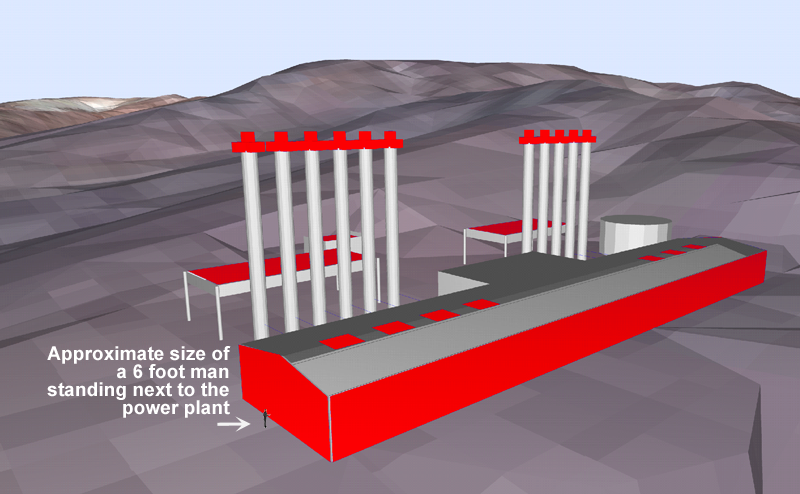 Construction of the generation plant, from mobilization, through site preparation and grading, to the start of commercial operation, is proposed to take place from March 2013 until June 2014. The cities of San Diego and Santee officially opposed this project. But the State has the power now to override local zoning rules, ordinances, and regulations (LORS). Click to view this video & distribute widely: Save Mission Trails! Stop the Santee Power Plant! We oppose the proposed Quail Brush Generation Project Power Plant. We are gravely concerned for our community’s health and well-being and dismayed at the potential destruction of open space land adjacent to Mission Trails, among other issues. We respectfully ask Cogentrix and its parent company Goldman Sachs (update – sold to Carlyle Group in Sept. ’12) to withdraw this proposal. We ask the CEC to deny permitting this project on East Elliott land. We wish Cogentrix and the CEC no harm. We only want to protect ourselves, others, and the wildlife and habitats affected by this proposed power plant. Join this fight, contact us, attend meetings! Please note: this is not an open forum. Therefore be it resolved, that the East County CRA and the Greater Santee CRA oppose the Quail Brush Power Plant and urge the San Diego City Council to uphold the will of the people and for the sake and safety of the community, by denying the appeal by Cogentrix for a zoning change and take a firm stand against the Quail Brush Power Plant, on this day of September 19, 2012. Just so you know. To email Barbara Boxer, you will need to go to her website and not a direct email. You will get a undeliverable message. BTW….how did the Santee Council Meeting go. I was not able to attend. The power plant is on the agenda for the Wed., March 28, Santee City Council meeting, 7 PM. We encourage everyone to be there to voice your opposition. 2. Are these engines water cooled or air cooled ? 3. Where will the water come from ? 4. What is the alternat fuel if natural gas is curtailed and what will that exhaust emissions be at 100% operation ? 5. Will the facility be EPA tested with both fuels at 100% with all 11 engines reunning before being given an operating permit ? 6. Will the plant ever go into 100% operation, meaning all 11 engines running ? 8.Is there an alternate site that this facility could be placed ? 9. Has an Impact Study been done on the proposed site to make sure there are no Insian artifacts,endangered insects,birdsand plant life? 10. What will be the noise level of the generation facility at the nearest house? Hopefully these wil get some answers that will make sense. The city of San Diego has used and abused Santee citizens enough! They placed a large dump on the border that nauseates our families on warm days—and they want to expand it! They want to build the Castlerock housing development to collect taxes for San Diego, but over-leverage Santee city resources such as schools and roads without any cost compensation. Now they want a power plant to spew increased pollution, further decrease property values in a depressed economy, and create a visual eyesore in our beautiful community. It’s time to send a message that enough is enough. More info – what type of power plant is it? How “clean” is it as far as power plants go? You can read the company’s application and all the technical details at http://www.energy.ca.gov/sitingcases/quailbrush/index.html as well as statements of opposition. we don’t “need more power plants”, we need to reduce demand and move to rooftop solar generation. If anyone thinks they will be able to sell their house if they are within 2-3 miles of this 400′ long 100′ high PP they are dreaming. The applicants very own info says there will be a 1 mi sound impact zone. We need your comments in the record Please email Eric Solorio the Project Manager for the Quail Brush Generation Project (natural gas power plant) adjacent to Mission Trails Park, we need your comments in the record ESolorio@energy.state.ca.us the decision makers will read your comments. So far, you have provided NO EVIDENCE of anything harmful. The plant is not near any homes to affect your property values, and we need more power plants, but not in your backyard right? The location of this plant is wrong. You don’t put an industrial power plant adjacent to and in full view of visitors to a regional park and natural preserve that’s the gem of San Diego, and close to homes and schools (less than 1000 yards). We do not want this plant.